The US has said it intends to negotiate three separate trade agreements with Japan, the UK and the EU. It could take several months before the negotiations begin, it said. The move is part of US President Donald Trump's efforts to reshape trade policies to support his "America First" agenda. It comes as the US has been fighting a trade war with China, the world's second largest economy. "We will continue to expand U.S. trade and investment by negotiating trade agreements with Japan, the EU and the United Kingdom," US trade representative Robert Lighthizer said. The US plans to start negotiations with Japan, the world's third largest economy, "as soon as practicable, but no earlier than 90 days from the date of this notice," Mr Lighthizer wrote in a letter to Congress. Negotiations with the United Kingdom will start "as soon as it is ready" after it leaves the European Union in March 2019, he said. 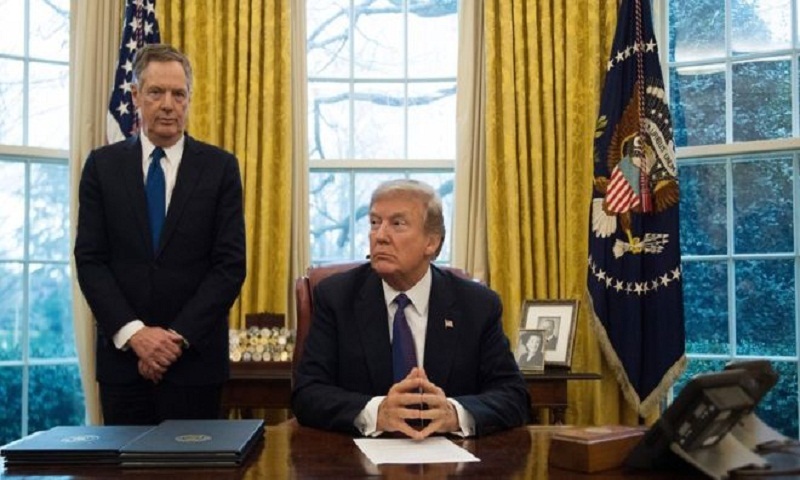 The aim is "to address both tariff and non-tariff barriers" and to achieve free, fair and reciprocal trade" Mr Lighthizer said. Mr Trump's preference for bilateral deals over multilateral ones is part of a more protectionist trade policy he has carried out since taking office in 2016. He pulled the US out of the Trans-Pacific Partnership deal early in his administration and has renegotiated a trade deal between the US, Canada and Mexico. Mr Trump's trade war with China continues to escalate, with companies already feeling the pinch and experts warning it will harm global growth. The UK, which is seeking to broaden its trading partners as it heads towards Brexit, welcomed the news. "The UK welcomes the US Administration's confirmation that it intends to begin negotiations for a Free Trade Agreement with the UK once we have left the EU," a government spokesperson said. While the UK is not able to negotiate trade agreements until it formally leaves the EU, a US-UK working group launched in 2017 has been preparing the ground for a potential future trade agreement.